The Lightest Premium Infant Car Seat just got better… Now featuring AirProtect™ Technology! The Maxi-Cosi Mico AP includes a car seat base that conveniently stays in your vehicle, while the removable car seat doubles as an infant carrier and includes a contoured, adjustable carry handle. The Maxi-Cosi Mico includes a car seat base that conveniently stays in your vehicle, while the removable car seat doubles as an infant carrier and includes a contoured, adjustable carry handle. Many parents enjoy the convenience of stay-in-the-car bases, which allow the infant car seat to be quickly removed from the vehicle without having to wake a sleeping baby. The Maxi-Cosi Mico can be partnered with the Quinny Buzz or Quinny Zapp stroller to create a stylish and lightweight travel system that's perfect for transporting an infant in safety and comfort. The Quinny Buzz and Zapp strollers can be used independent of the Mico car seat once your baby reaches at least six months old and is able to sit upright unassisted. The key to any travel system is the seat base, and the Mico base allows the car seat to be locked securely into place or swiftly and quietly removed with one easy click. The Maxi-Cosi Mico AP base features an adjustment lever that allows the front of the base to be raised or lowered for a perfectly level fit in any vehicle seat. To make leveling even easier, the Mico AP seat shell includes a "level line" to help guide installation. The Maxi-Cosi Mico AP seat base is compatible with lap belt and shoulder belt harnesses as well as the LATCH (Lower Anchors and Tethers for CHildren) anchoring system that accompanies most vehicles made after 2003 and a few models made in 2000 to 2002. If you do not have the LATCH anchoring system or if you'll be using the car seat in an older model automobile without self-locking safety belts, the Maxi-Cosi Mico AP includes a locking clip that will enable you to tightly secure the vehicle's seat belt. The locking clip is conveniently stored on the back of the child seat. The Lightest Premium Infant Car Seat just got better… Now featuring AirProtect™ Technology! The key to any travel system is the seat base, and the Mico AP base allows the car seat to be locked securely into place or swiftly and quietly removed with one easy click. The Maxi-Cosi Mico APs base features an adjustment lever that allows the front of the base to be raised or lowered for a perfectly level fit in any vehicle seat. To make leveling even easier, the Mico AP seat shell includes a "level line" to help guide installation. The Maxi-Cosi Mico AP seat base is compatible with lap belt and shoulder belt harnesses as well as the LATCH (Lower Anchors and Tethers for CHildren) anchoring system that accompanies most vehicles made after 2003 and a few models made in 2000 to 2002. If you do not have the LATCH anchoring system or if youll be using the car seat in an older model automobile without self-locking safety belts, the Maxi-Cosi Mico AP includes a locking clip that will enable you to tightly secure the vehicles seat belt. 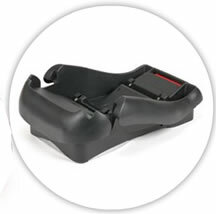 The locking clip is conveniently stored on the back of the child seat. The Maxi-Cosi Mico AP infant car seat includes a five-point harness and four harness heights to ensure a secure fit for your growing baby. An up-front harness adjustment strap and release lever make it easy to snug or relax the harness. Mico AP seats are equipped with energy-absorbing EPP foam that cushions and protects the precious passenger for a safe and comfortable ride. Newborns and smaller children will be extra comfy with the plush Cozi-Dozi insert that comes standard with every Maxi-Cosi Mico AP car seat. 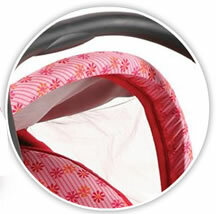 The Mico AP also features harness covers to protect babys delicate neck from irritation. Parents can rest assured that the Maxi-Cosi Mico APs harness covers, seat fabric, and newborn insert are all removable and washable. The Mico AP also features an integrated canopy with see-through side windows, so baby can satisfy her curiosity by gazing out at the passing world while still being protected from the sun. In addition to safety, function, and comfort, the Maxi-Cosi Mico is one of the most chic and eye-catching infant car seats on the market. The Mico's clean lines and modern, stylish color schemes are perfect for parents who want striking color without a bold or obnoxious pattern. Matching accessories are available, including the Maxi-Cosi Mico Infant Car Seat Footmuff to keep your baby warm and cozy in colder climates, as well as the Maxi-Cosi Mico Infant Car Seat Netting and Rain Shield to protect from insects and the elements. For those parents who plan to travel by air during their baby's first year, the Maxi-Cosi Mico car seat is approved for aircraft use, meaning you can secure the Mico into an aircraft seat to keep your baby safe and your hands and lap free. 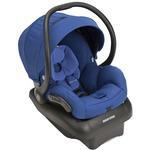 Of course, always check with your airline for any size requirements or other regulations regarding child seats. American parents are quickly learning why the Maxi-Cosi Mico Infant Car Seat is a long-time favorite among European moms and dads. 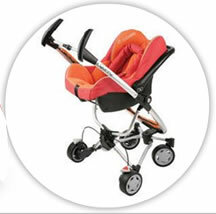 BabyEarth.com carries the Maxi-Cosi Mico and related accessories in all six vibrant colors, as well as the compatible Quinny Buzz and Quinny Zapp strollers to create a complete infant travel system. In the summer of 2007, the European-based Maxi-Cosi brand made its long-awaited U.S. debut, bringing more options to parents on this side of the pond who want car seats that are both safe and stylish. 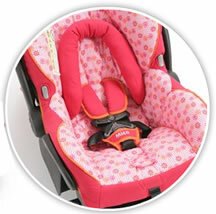 Maxi-Cosi is part of the Dorel Juvenile Group, a global child product manufacturer that also markets other leading baby product brands, including Quinny, Cosco, and Safety 1st. 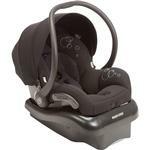 The Maxi-Cosi Mico is a rear-facing only car seat suitable for infants from five to 22 pounds and 19 to 29 inches tall. Most safety experts agree that newborns are best protected in rear-facing only seats, rather than those that convert from rear to forward facing. Rear-facing only car seats are better suited for a smaller body and allow the baby to travel in a semi-reclined position, relieving pressure on the spine and neck.